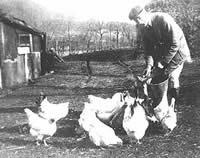 In the past, although farms were small, they were mostly owned by wealthy landowners, and the farmers were tenants. Noteable landowners around Llangollen included the Williams-Wynns (see map), the Myddletons of Chirk Castle and the Trevors. This trend has gradually changed and, until recently, most were owned by individual farmers. However, agriculture is now in crisis and as small farms go out of business, they are being taken over by larger landowners again. The small family farm is fast becoming a thing of the past. 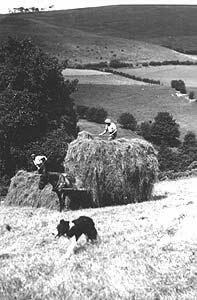 In the 19th and 20th centuries the rural population was far greater and families much larger. It was not uncommon for families of up to 20 people to live in the same house. Much of the housing was rented accommodation belonging to the landowner. In recent years more houses have become privately owned, but house prices have soared, making it hard for young people to stay in the rural areas. Because of the geography of the area, hill farming is the norm – sheep are kept in the valley fields in winter and graze the hilltops in summer. Cattle are kept mostly for beef and dairy herds are few. Many years ago, pigs were kept in and around Llangollen but they are a rare sight today. Religion was once a very important part of rural life – children would not play, men would not work on the farms, washing would not be hung out on a Sunday. Families would attend chapel or church once, if not twice, on the Sabbath. Sadly, many of the rural chapels and churches have closed and those still open have dwindling congregations.